Chris Demetre’s family ties in Napa led him to experience wine, and his passion for winemaking grew as he took courses at Napa Valley College and U.C. Davis. Chris received his BA in Geological Sciences from U.C. Santa Barbara and began his career with Chevron, designing and supervising work on oil rigs. During this time he also continued his education and received an MBA from U.C. Irvine before becoming a manufacturing manager for a biotech company. His passion for wine led him to France, where he rode his bicycle the circumference of the country, visiting every major wine region, to learn the styles and flavors to be found there. When he returned to Napa, he began fermenting wines for vineyard owners that wanted wines that showcased their fruit. 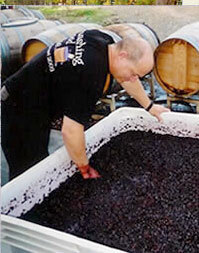 Chris began making wine for Orentano Wines in 2007 when Ron was a client of the Napa Sonoma Vineyard Group. They worked together in this manner through the 2009 vintage. In 2010, Chris officially became the Winemaker for Orentano Wines. Chris strongly believes that the quality of the R. Buoncristiani Vineyard, in which Orentano Wines’ grapes are grown, positively influences the wine they produce. In Chris’s opinion, the vineyard was put in properly to begin with, and it is managed very well. He feels that the vineyard is a textbook example of what a vineyard should look like. There are two slopes, to the east and west, from a central point, which provide excellent drainage for the vines. The grapes are never over-cropped. There is good separation between the clusters and there is good ventilation going through the fruit zone. Chris enjoys making wine from this property because it’s farmed so impeccably. He feels that the role of the winemaker is to recognize when the grapes are ready to be picked and then shepherd them through to a final product. Chris is a proponent of classic-styled Pinot Noir. He believes that the alcohol should be kept under control and the wine should be balanced so that it can be enjoyed with food. He describes a spectrum of wine flavors in Pinot Noir that starts out in the light red fruits of strawberry and cranberry and makes its way to the black fruit of cherry and blackberry. Where the pick time is set will establish the fruit component of the wine. Chris prefers to pick the fruit at night, which he feels is optimal for quality, when it is around 45 degrees, and then cold-soak it for three days. Cold-soaking is an American appendage to the Burgundian techniques he likes to use for Pinot Noir. The Russian River Valley is an ideal place to make Pinot Noir, according to Chris, because the climate is cold. It is actually very similar to the climate in Burgundy, which is where Pinot Noir was developed to grow. The climate allows growers like Ron to grow fruit that retains its acidity. The result is a Pinot Noir with ripe fruit that can get to the cherry and black fruit phase of the flavor spectrum, while also containing some of the red fruit flavors too. The complexity of Orentano’s Pinot Noir comes largely from the Russian River Valley climate in which it’s grown. Chris lives in Napa with his wife Nicolette.